Thanks to Okada-san for the photo! Or 鮭親子丼 / shake oyako don. Shake = salmon. Oyako = parent and child. So there's the canned salmon bits -- the 'parent', and then there's the orange tapioca-like salmon roe -- the 'child.' There's also some nori shreds in there. Yummy! Oyako is more commonly used for chicken: (chikin) oyako don - a bowl of rice topped with chicken and egg. 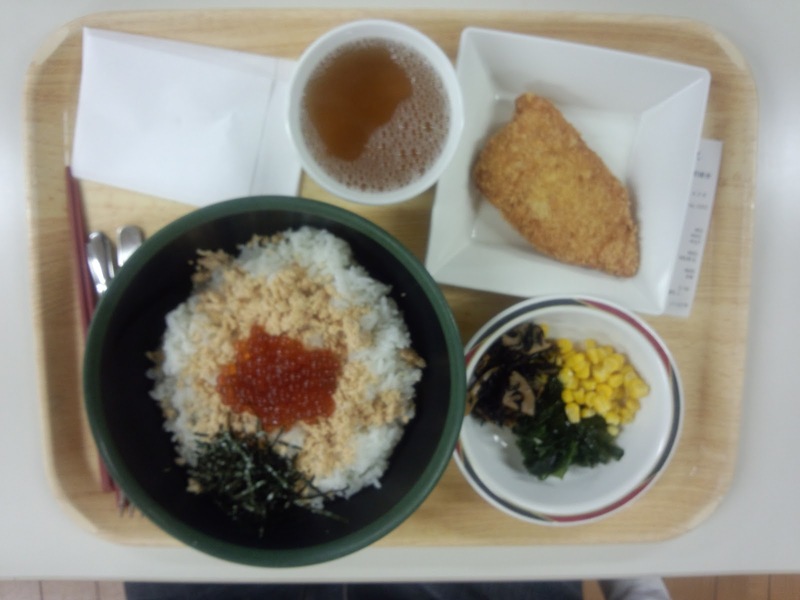 The L size is 504 yen from the cafeteria. I thought this won't be enough for me, so I also got sasami chiizu katsu (chicken and cheese cutlet, 157 yen and similarly yummy but obviously in a different way) and some Japanese veggies from the salad bar: wakame (a type of seaweed), hijiki (another type of seaweed, relatively much smaller in size than wakame and black in color) and lotus roots and carrot salad, and sweet corn. This was way above my usual meals here -- more than 600 yen -- and it is because salmon roe is generally expensive (try eating salmon roe sushi at a sushi bar). But it was a very good meal. Amen. Are you new or coming soon to Japan? Or, check out all our "welcome to Japan"-related articles. "Itsumo" lyrics and translation - final correct version? Cherry Blossom Forecast for 2013! (c) 2005-Present RONJIE.COM. Simple theme. Theme images by Nikada. Powered by Blogger.